14th November is the birthday of Pandit Jawaharlal Nehru, the first prime minister of India. In honour of his dedication to the welfare and education of children, this date was chosen for the annual Children’s Day. As usual, children at all CRS centers in Kolkata celebrated the day with enthusiasm, and this included performances of dance and song. 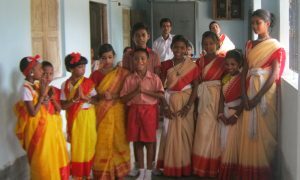 Thanks to the support of the Rotary Club of Calcutta, Outram, the children also received a packed lunch and gifts. A report by United Nations Educational, Scientific and Cultural Organisation (UNESCO) revealed India to have 287 million illiterate adults, the highest number in the world. While there is full literacy among affluent Indians, the poorest members of society are not projected to achieve universal literacy until 2080. In 1965, UNESCO declared 8th September as International Literacy Day. 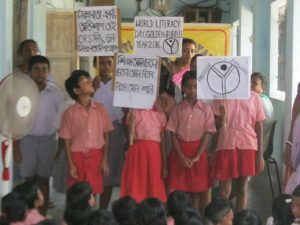 This year’s 50th Anniversary honoured five decades of efforts to increase literacy rates worldwide. 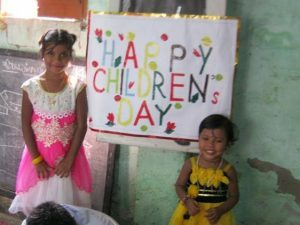 Children from the Sihsu Jagat (Children’s World) programme at the CRS Education Centres in BD Colony and Sukantanagar organised this year’s celebration including songs and recitations by children and teachers. Women and girls who attend the CRS skills training programme also shared what difference literacy made to their lives. Raksha Bandhan is an annual festival in India and Nepal that celebrates the love and duty between brothers and sisters. The name means ‘bond of protection’. It is a day when siblings wish each other happiness and goodwill. Sisters tie a rakhi (sacred thread) on their brother’s wrist symbolising her love and prayers for his well-being. Then brothers make a promise to their sisters to protect them from all harm. Children from the Shishu Jagat (Children’s World) programme at the CRS education centres in Basanti Devi Colony and Sukantanagar organized a Raksha Bandhan celebration on 18th August. Rabindranath Tagore, the writer, poet, playwright, musician and philosopher, is much beloved by Bengalis. His work greatly influenced Bengali culture in the late 19th and early 20th century and he was the first Asian to win the Nobel Prize for Literature. Bengali people around the world celebrate every year on his birthday anniversary in early May with a cultural festival called Rabindra Jayanti. 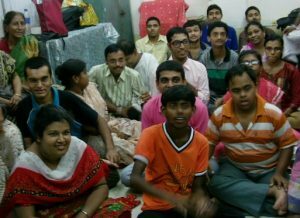 This year children from the CRS Education Centre at BD Colony celebrated the day by performing some of Tagore’s songs and dances, and reciting select poetry and prose. One of the teachers also gave a talk about his contributions to society and culture.